It’s time for date night. 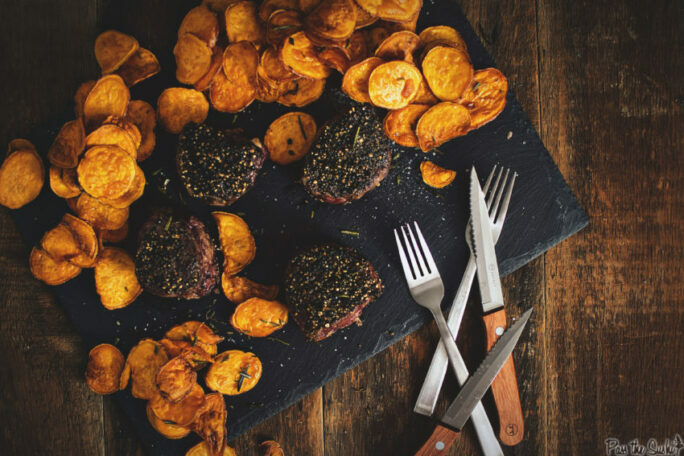 Forget getting dressed up, wasting gas, fighting traffic, and over paying for a meal much better prepared at home. I’m bringing date night right to your table. No frill, no wait. Just dinner. Shove everything off the table, light some candles, turn on your ideal tunes. It’s time to turn up the Marvin Gay. 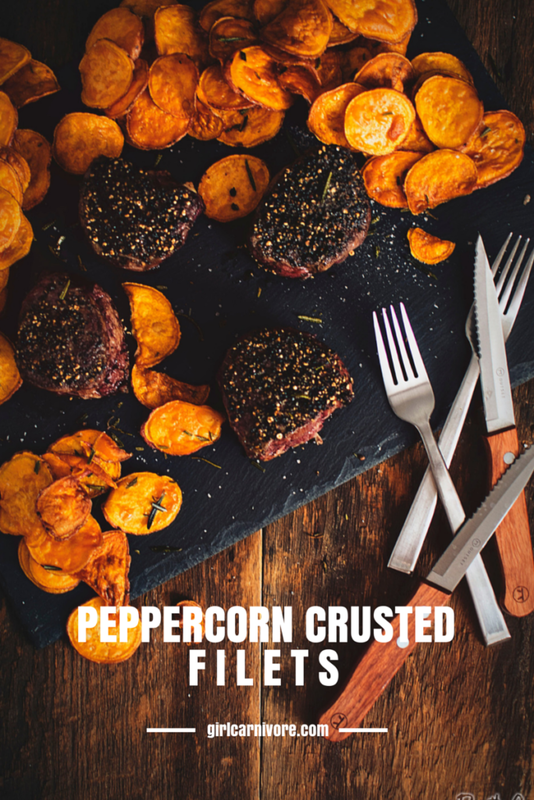 Why pay too much for these peppercorn crusted filets when you can slice a whole tenderloin at home and bring the sizzle back to your living room. In a small saucepan, cover the peppercorns with 1 1/2 cups canola oil. Bring to a low simmer over medium heat. Remove from heat and allow to steep for an hour. Strain the oil into a resealable container and place the peppercorns in a mortar and crush with a pestle until no large specks remain. Pour the crushed pepper onto a smooth work surface. 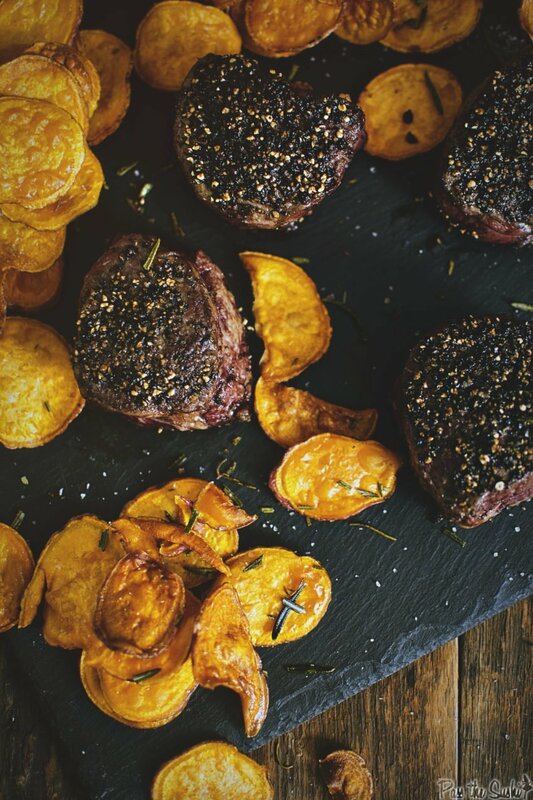 Press both sides of each steak into the crushed pepper and allow to come to room temperature for 30 minutes. Preheat the oven to 350 F. Arrange a wire rack in a roasting pan. In a large skillet, heat a tablespoon of canola oil. Sprinkle the steaks with salt and add 3 at a time to the pan. Sear on both sides, 1 1/2 to 2 minutes per side. Transfer to the prepared rack. Repeat with the oil and remaining steaks if needed. Place the roasting pan in the oven and cook for 18 minutes, or until the beef internal temp is 125 - 128 degrees F. Remove from oven and rest for 10 minutes before serving. Season with a sprinkle of coarse salt before serving. Mmm and the homemade sweet potato chips! Can I come over for date night?